Help prepare for a party and then celebrate with this adorable birthday themed baby! Kids can pretend to send invitations and wrap the doll's gift by placing the teddy bear in the box. Prepare the cupcake for the party by choosing one of the two cupcake toppers. At the party, Cupcake Birthday Baby can even hold her gift and her cupcake! Baby's favorite part of her party is blowing out her special candle; with a little help, the candle goes out! 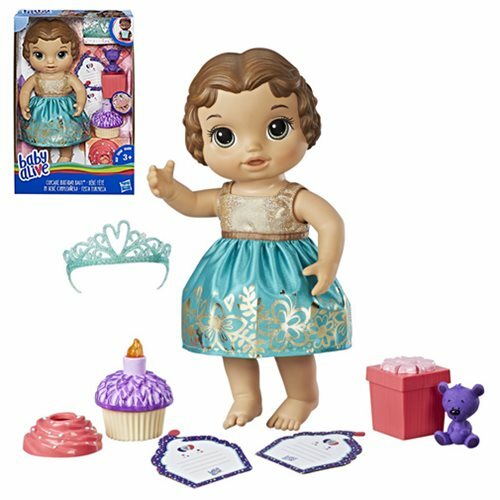 Includes doll, dress, cupcake, tiara, bear, 2 invitations, present box, and 2 cupcake toppings. Ages 3 and up.